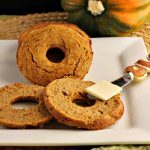 Grain free pumpkin bagels with a low carb and paleo version depending on sweetener of choice. cup Milk of choice: ¼ unsweetened coconut or almond milk. 1 tsp vanilla extract (get organic gluten free kind like this one). Preheat oven to 350 F, and grease or oil generously a bagel or donut pan. In large mixing bowl combine: sifted coconut flour, golden flax meal, pumpkin pie spice, cinnamon, and sea salt. Mix together well. Set aside. In a separate mixing bowl combine: eggs, pumpkin puree, milk of choice, vanilla extract, sweetener of choice, and melted butter or coconut oil. Mix baking soda and apple cider vinegar together in pinch bowl. Add baking soda- apple cider vinegar mixture to egg mixture and stir together. Spoon Batter into pan forms and spread around with the back of a spoon or a spatula. Wipe the center, hole part of the form clean with a damp paper towel. Bake for 23 to 25 minutes, or until the tops are browned and firm. Remove from oven, and cool completely before removing from pan. Using a butter knife in-between bagel and pan edges then slide around to loosen and lift out. Serve with butter or cream cheese for low carb and primal, or serve with honey or coconut butter for paleo.